Wellingborough was in the news yesterday and today as the River Nene burst it's banks and there was a lot of flooding. This shot is of the car park. The narrow boat is moored where the river comes through the town. Not sure how the occupants got off their boats. Many thanks for all your lovely comments and Favs - so very much appreciated!! I was thrilled to see my Kingfisher flying on the TT today and especially to be there in such great company!! Scary situation but lovely view. Wow, that's a lot of water! I hope that the water damage is minimal. Wow! Flooding is never good but it does make for some fantastic shots, doesn't it? This is excellent. Fabulous Pam. I love the reflections and the narrow boat is a wonderful focus. The flooding does create a beautiful scene. I have an ex RAF friend who lives in Wellingborough. I must email her and hope she is okay. Lovely reflections, although not good to have all that flooding..
That is a lot of water! I hope it didn't flood into the buildings. Lovely light & reflections. Wonderful shot! Great photo. hope the water is a bit cleaner than it looks! Whoa! That is definitely a flood....... But you got a great reflection shot. Oh gee, hope you're not in danger of getting flooded. What a fab shot, what's the old mill building? WOW...this is wonderful. FaVulous reflections, comp and colors. The reflections are wonderful but so sorry about the flooding. Hope all returns to normal soon. Seems there's a lot of flooding around at the moment again. Lots of people in Paris are worrying about the levels of the Seine as well. Lovely capture Pam. 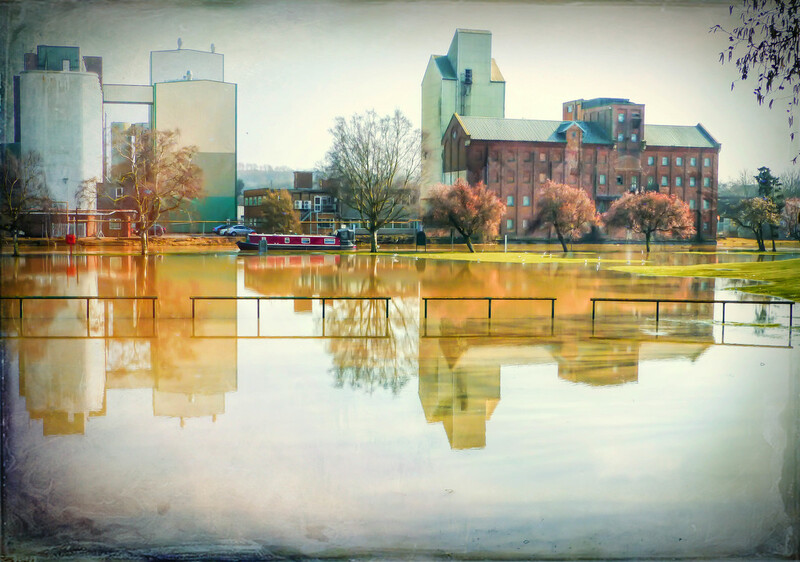 Wonderful reflections, but the flooding is bad--hope the water recedes quickly. Sad about the flood but what a great reflection!